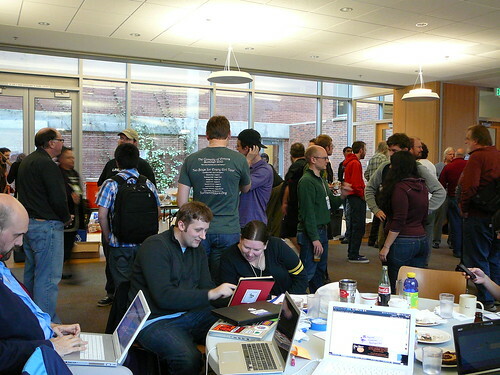 We’re happy to announce that Barcamp Portland 5 will be May 20-21, 2011 at the Eliot Center in downtown Portland. That’s right, your favorite unconference in the same great unconference space as last year but with all new sessions and ideas: from knitting to nerdlings, plus the social web and its spiders, and beyond! Want to know what Barcamp is? Read about it here. Want to help create Barcamp? Join our planning group and/or attend our first volunteer meeting on March 21st at 6:30pm at the Lucky Lab Tap room (calagator link). As with every Barcamp, we need your help to make the event run smoothly. Volunteer positions are available before and during the conference–come to the meeting to see! Interested in sponsoring? Drop an email to sponsor@legionoftech.org. This entry was posted in Announcement and tagged bcp5 by Christie Koehler. Bookmark the permalink.